Are you getting ready for the new school year? How about a little help? My package contained a big box of Cheerios, 8 count Crayola Dry Erase crayons and a $20 Target Gift Card for buying school supplies! Now we can start the day off right with Cheerios and then start the school year off right with Crayola and some school supplies from Target. Mom, while you’re stocking up on back to school supplies for the kids, stock up on on-the-go breakfast solutions, as well! Look on specially marked Nature Valley®, Pillsbury® Toaster Strudel® Pastries, and Big G Cereals at your Target Store! You could save up to $5 on Crayola products with a coupon on pack! Also, on the back of all cereal packaging is fun Crayola® coloring activity – perfect to use your new Dry-Erase Crayons on! 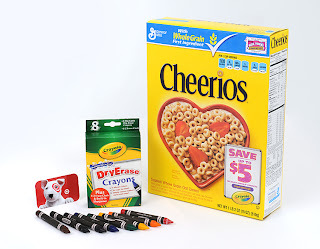 Would one of my neighbors like to win a Crayola, General Mills, Target Prize Pack? Hurry up and enter! Need more composition books and pens. My son's classroom still needs paper towels and tissues, plus any art supplies we can give them. I need more pens and pencils. School starts on Wednesday. I am betting the teacher will have a list. Last year they just asked for money. I still need more notebooks! We need a few more notebooks and a decent pencil sharpener. I still need to purchase pens, folders, and a mini stapler. I still need to get my 6th grader some folders and notebooks that we forgot the last time we went shopping! A Dictionary and pens is what I still need to get. the grandkids still need some clothes and whatever the teachers didn't put on their supply list. I have learned there is always another list coming . We still need paper and new pencils. School started yesterday for my kids and I don't need to purchase anymore supplies. We have purchased all of our supplies...hurray! I need some pencils and paper. I need to get a backpack. i need to get gym shoes for them and back packs and some paper.. I want to get my grandson a backpack. I still need to get lunch boxes. We could always use new clothes. I still need to get some locker organizers and a locker combination lock for DD yet. we need to still get special calculators for our kids, locks and shoes/sneakers. I still need to get pencils and big pink erasers. I still need to get composition notebooks for my daughter! Hand sanitizer and marker pens. All of them, lol. I have some crayons, glue sticks and markers, but I need to buy everything else. I need folders and backpacks. I don't need to purchase any school supplies. I am all done school shopping. Leave a comment here telling me what school supplies you still need to purchase! I need to purchase some more clothes and sneakers for my son,pens and pencils,,and lots of snacks! The school shopping is done! actually none I am done!! thanks!! Just a few more notebooks. Art supplies, backpack, and labels. I'm happy to say that we have everything bought - thank you! I need to purchase notebooks, pencils and markers. We need to get notebook paper and binders. Definitely some new school clothes! I need more pens and a marker. NONE I am happy to say the School supplies portion is done! I still need to buy a lunch box. I need more printer ink. need to purchase folders and notebooks. We are finished for now. School started 2 weeks ago. We will need more in January when all new classes start. thank you! I'm pretty much done, but could probably use more glue sticks and white glue. We still need to purchase a few science supplies. I still need highlighters and binders. I need glue sticks and a back pack still. The last thing I have on my back to school list is shoes for the girls. But my youngest would love some Crayola Fabric markers! I'm done - but would love this stuff for my little guy still at home! I need to buy some binders and filler paper. I need some notebooks still! We need to buy clothes, the most important thing! I still need colored pencils and a pencil holder. I need to buy printer ink and paper. Lots. We just need to pick up a few extra notebooks and were good! pretty much everything. im a slacker. We have all we need at the moment, but we're running short on copy paper! I need to get ink cartridges. I still need to get a backpack, filler paper, and mechanical pencils. I got it all done already! I have everything that I'm going to need! School provides everything for the kids. I bought new Crayola crayons for at home. I still need to get my son a pencil box, would you believe they were sold out? My kids need these specific folders that I can't find. We still need some homeschool supplies. More index cards, storage bins, and chalkboard erasers. I still need to get note book paper! I am all stocked up for school. Thanks!! I need to buy my daughter an accordion folder. I still need to get more notebooks and folders. We are pretty set, I would like to purchase some more art work. I need more homeschooling books and flashcards. I still need to get notebooks and pencils. I need to buy paper and folders. School hasn't started here yet, so we need most everything. I still need to get my daughter's backpack and some binders. I still have to get a binder for my 4 th grader.